Next up in my series of wonderfully intelligent leaders I think you should know is someone who has made his mark in the Marketing Communications space in many ways, including developing IBM’s groundbreaking blogging guidelines. Today, he leads a team of internal, multimedia and external communicators who activate, inspire and inform his organization’s 18,000+ employees. I hope you enjoy this next Q&A! Q: As the Global Head of Employee and Innovation Communications at Bloomberg, how do you talk about the value of internal communications today? A: There are many ways that effectively communicating with and through your employees can create a ton of value for your organization. These days I've had many conversations within Bloomberg and with leaders at other companies about how there's a power shift underway that organizations need to account for and address. Namely, the historical asymmetry of power that existed between employees and employers is changing pretty radically – particularly among highly skilled workers. What I mean is that for a long time, if you wanted to do anything really big and impactful, you had to rely on an employer's funding, infrastructure, networks, access to markets, publicity and training. All of those things existed in their most concentrated forms within corporations because they were so expensive. But this is no longer the case with the advent of (for lack of a better word) 'digital' which has allowed the same set of motivated and ambitious people who would have otherwise spent their energy climbing the corporate ladder to raise money through crowdfunding, spin up their own infrastructure on AWS etc., aggregate and manage their own networks on LinkedIn, market and promote their products on any number of virtual and social marketplaces and, of course, self-train through systems like Lynda, Khan Academy, Code Academy, etc., etc., etc. Q: What’s the biggest communication opportunity you see at Bloomberg? A: Well, we are a founder-led company with an amazing founder. Mike really has a very special power to clarify things for everyone here and the story of our company's inception 35 years ago still has a ton of impact on us (even those of us who were in elementary school at the time!) Just yesterday he addressed an event – Goldman Sachs' 10k Small Businesses – and a story he told ended up in the press. We will run the video on our employee-facing platforms and I won't be surprised if it is the most-watched content for the month. So, the opportunity for us is to see how much of that founder magic we can bottle up and sprinkle strategically. 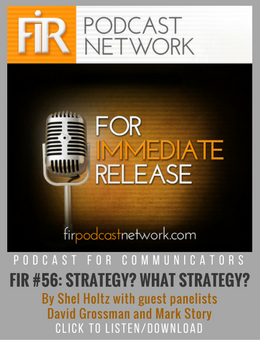 Q: What's a wish you have about internal communications today? A: I don't mean to argue with the question, but fundamentally, I wish we could stop calling what we do "internal communications." I don't think internality and externality are particularly helpful concepts in modern communications practice since digital makes every real and metaphorical firewall more permeable than ever. If I absolutely had to reduce a human population to a technical term, I think I'd say employees are more usefully thought of as a thinking, feeling, curious network of autonomous radiators and sensors of information. I mean, the idea of employees being internal is kind of a cross between wishful thinking and anachronistic ignorance. After all, we not only pay some of our most important employees to speak with our customers (like, the entire sales team! ), but employees of every firm have access to the same or better publishing tools as do the professional communicators. Q: What tried and true strategies do you count on to help leaders understand the value of communications? A: The main strategy I employ is beginning every project with this question to stakeholders: "What behaviors among employees would indicate that we are making progress towards the business outcome you are trying to drive?" If we can isolate the behaviors that indicate business impact (or that are proximal to business impact) we can work back from there. Oh, and this approach should give us some really good measurable outcomes to look for too. Q: Who in business do you most admire today and why? Q: What about your role brings you the most joy? A: I absolutely adore working with creative, motivated people – and that is all I do. Over the past few years, Bloomberg has allowed me to invest in bringing together a stellar team of writers, editors, public relations experts, video producers and designers. The fact that I get to make cool stuff with them every day is truly joyful. Ethan McCarty is the Global Head of Employee and Innovation Communications for Bloomberg LP. where he leads a team of internal, multimedia and external communications professionals who activate, inform and enable Bloomberg’s 18,000+ employees worldwide. Externally, Ethan’s team tells Bloomberg’s innovation story through its people, workplaces and technologies. Before joining Bloomberg, he was Director of Strategic Consulting and Integration for IBM’s Worldwide Marketing and Communications Labs, where he integrated creative, data, and business disciplines and ensured Marketing and Communications teams around the world used the best practices in design, digital communications and modern marketing. Ethan has a Master’s degree from the New School for Social Research in New York City and a Bachelor’s in Creative Writing from Ohio University. He is a member of Page Up‘s Operating Committee and an alumnus of the Arthur W. Page Society’s Future Leaders Experience. Ethan is a Lecturer on Digital Media and Analytics at Columbia’s Strategic Communications Masters program in their School for Professional Studies. He is also on the Board of the Graphic Communications Scholarship Fund, the Dean’s Advisory Council for Ohio University’s School of Communications and the Advisory Commission of New York City College of Technology’s Department of Communications Design. As a communicator, technologist, former journalist and ex-IBMer, Ethan often takes the last shrimp at cocktail parties and is prone to dominate games of buzzword bingo. He, his wife and two adorable, nuclear-powered sons live in Brooklyn and frequently eat kale. He tweets now and again at @ethanmcc and blogs intermittently but with gusto at www.ethanmccarty.com. To read more executive Q&As in our Someone to Know Series, click here. Click below to download the eBook—Going Slow to Go Fast: Making Internal Communication Work For You—and learn how to navigate the core challenges that today’s communicators face: technology, culture changes, company leadership, and more!